The popular self catering and B&B accommodation Haus Holzapfel is situated in the up market, peaceful and quiet area in the highest street of Beaufort West. We are 1.1km away from the city centre and the N1 Highway Cape Town - Johannesburg. A homely, friendly and welcoming atmosphere awaits you at our comfortable guesthouse, which opened in September 2007 and is famous for its cleanliness and German standard on quality. Honeymooners and those seeking something special will delight in the exclusivity that the Suites offer. 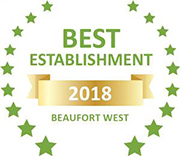 Based on reviews of establishments, Haus Holzapfel has been voted Best Establishment in Beaufort West for 2018. 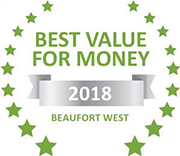 Based on reviews of establishments, Haus Holzapfel has been voted Best Value for Money in Beaufort West for 2018.